Sparse Matrix Technology presents the methods, concepts, ideas, and applications of sparse matrix technology. The text provides the fundamental methods, procedures, techniques, and applications of sparse matrix technology in software development. 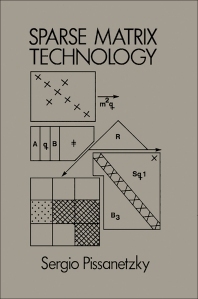 The book covers topics on storage schemes and computational techniques needed for sparse matrix technology; sparse matrix methods and algorithms for the direct solution of linear equations; and algorithms for different purposes connected with sparse matrix technology. Engineers, programmers, analysts, teachers, and students in the computer sciences will find the book interesting. 4.3 Breadth-First Search and Adjacency Level Structures .